Available only from Walking Barefoot Ministries. Click here! Also available in CD and as MP3 downloads (see below) and at iTunes. Someone has said that prayer is not about overcoming God's reluctance, but about laying hold of His willingness. This can also be said of healing ministry — it is not about overcoming God's reluctance, but laying hold of His willingness to heal. God's willingness is seen in His Word, where He has repeatedly revealed His desire to heal His people. The format of healing Scriptures and healing prayers is designed to help you lay hold of God's willingness to heal you by laying hold of His Word and praying it back to Him in faith. This is also a great tool to help you minister healing to others. 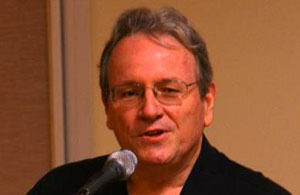 "Jeff Doles has blessed the body of Christ with Healing Scriptures and Prayers. This well written book will take the reader on an enlightening journey through the Word of God. Familiar passages of Scripture will take on new meaning and many special treasures of knowledge will bring increased understanding of the ways and the grace of God. This book is not just for those wanting physical healing, but for everyone who wants a deeper and richer relationship with God." "I know this book comes from the heart of Jeff Doles, because he has a passion to see people walk in divine health. I have known Jeff for years as a student and lover of the Word of God. He has done a wonderful job laying out the scriptures on healing. As I read through them, my heart explodes with faith as I see the great love and plan God has for His people. I love the prayers because they are such a practical way to make the scriptures become yours. I believe this book to be an excellent resource for those hungering to walk in divine health." 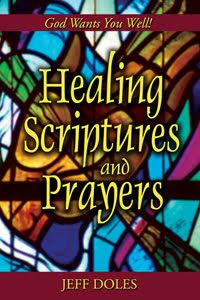 Volume 1 of the Healing Scriptures and Prayers audio collection. Available in CD and as MP3 download. Discover the powerful dynamics of prayer and faith in the Old Testament. Over 60 minutes of soaking prayer from the Psalms, Proverbs and Hebrew Prophets to help you receive healing from God. Volume 2 of the Healing Scriptures and Prayers audio collection. Available in CD and as MP3 download. Discover the powerful dynamics of prayer and faith in the New Testament and learn how to appropriate them for your healing. Over 66 minutes of soaking prayer from the New Testament Scriptures to help you receive your healing from God. Volume 3 of the Healing Scriptures and Prayers audio collection. Available in CD and as MP3 download. Discover the names of God in the Bible that display His ability and desire to heal. Over 70 minutes of soaking prayer and meditation on the healing names of God in the Bible to help you receive healing for your spirit, soul and body. Plus bonus tracks on choosing life, and the new covenant we can have with God through Jesus Christ. Volume 4 of the Healing Scriptures and Prayers audio collection. Available in CD and as MP3 download. Discover how the healing ministry of Jesus reveals God's will and desire to heal. Over 70 minutes of soaking prayer on the healing ministry of Jesus to help you receive healing from God.